During each individual visit, which lasts from four to six minutes, the physician introduces the patient to all members of the team and involves the patient in a discussion about their care. Emory Saint Joseph's Hospital has implemented two Accountable Care Units (ACUs) featuring the SIBR® (structured interdisciplinary bedside rounding) program, which involves a collaborative health care team meeting with patients in their rooms to discuss their daily plan of care. 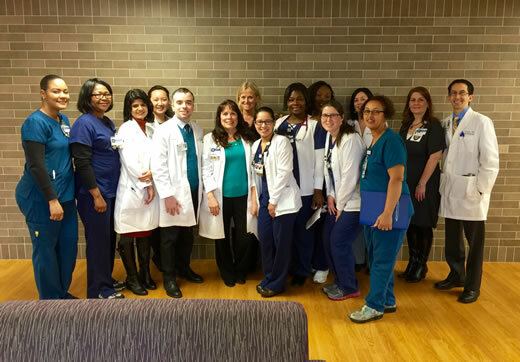 SIBR® is conducted on the stroke and internal medicine units at Emory Saint Joseph's, and the health care team for this new model of patient-centered care consists of the physician, nurse, nurse assistant, social worker, therapist and pharmacist. During each individual visit, which lasts from four to six minutes, the physician introduces the patient to all members of the team and involves the patient in a discussion about their care. Each team member comes to rounds prepared to discuss areas of concentration such as overnight events, the patient's goal for the day, nurse's concerns, vital signs, pain control, intake, output, mobility, medication management and discharge plans. "SIBR® is a great way to ensure that patients know what is going on with their medical care, directly from the entire caregiver team at the same time," says Ginger Parks, MSN, RN, director of the Pulmonary and Internal Medicine Unit. Once the team and patient have agreed upon a goal and plan for the day, the team excuses itself and moves to the next patient's room. According to Heather Gloede, RN, MSN, unit director of the Neurovascular and Stroke Unit, the patients and families have benefitted from the health care team's open discussion about each individual's personalized plan of care, and this has resulted in shorter lengths of stay. "SIBR® puts the patient at the center of the discussion about their care, and families often say during the rounds that 'it's nice to see we have a team taking care of us,'" says Gloede. The SIBR® program was designed by Jason Stein, MD and refined with Bryan Castle, BSN,RN, MBA at Emory University Hospital. Castle is the project director on a $1.5 million award from the Health Resources and Services Administration (HRSA) to develop seven new units within the Emory Healthcare system. These include the two new units at Emory Saint Joseph's, two new units at Emory University Hospital Midtown, and three additional units planned across Emory Saint Joseph's Hospital, Emory John's Creek Hospital and Emory University Hospital. Today, the ACU/ SIBR® model has been implemented in more than 30 hospitals across the U.S., in Australia and New Zealand. As part of the HRSA ACU project, Castle is also developing a toolkit and training videos for the ACU/ SIBR for other hospitals and units interested in launching their own Accountable Care Units.